Amazon.com description: Product Description: Now Updated and with New Success Tips! Did you ever have a great boss? Everyone should have one, but not enough people do. If you're a boss, or hope to become one, or have a less-than-great boss, then this is the book that could change your career--and your life. In times like these, being a great boss can be harder than ever. If you want surprising and useful advice on how to handle the tough stuff--from having to fire a long-time employee to being a new boss with a demoralized team--the stories, observations, and advice contained in this gem of a book will set your feet in the right direction. And if you just want advice on living up to the legend who preceded you in the job, or even ways to emulate someone who was a great boss to you, Jeffrey Fox has gathered anecdotes from some of the mightiest and most respected bosses in America. The bestselling author who brought you How to Become CEO and How to Become a Rainmaker knows the territory about which he speaks. Fox is the master of the counterintuitive angle. For every boss who has implied "I know what's best, that's why I'm the boss," Fox counsels, "Listen to Phonies, Fools, and Frauds" and "Don't Check Expense Accounts." His stories from bosses who have cared equally for employees' lives and the bottom line will inspire you to see that profit counts, but so do camaraderie, motivation, and a great place to work. In a time of considerable corporate downsizing, it's more important than ever for bosses to surround themselves with motivated employees. 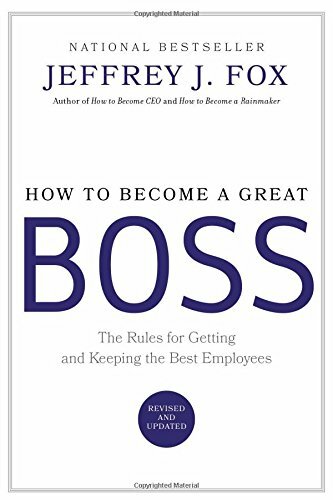 Jeffrey Fox's How to Become a Great Boss will have a place on the shelves of top brass everywhere who want to remain leaders of their pack. About: A practical guide to business leadership offers advice on how bosses can get to and stay on top by fostering teamwork and by creating a firm network of support. About: A practical guide to business leadership offers helpful advice on how bosses can get to and stay on top by fostering teamwork and by creating a firm network of support, offering advice in such chapters as 'Paint the End First,' 'Groom'em or Broom'em,' and 'The Practice Bus.